3432 Sunnyside Ave. in Philadelphia's East Falls neighborhood has built-in irrigated planters and enough light to grow a lemon tree. When real estate agent and developer Fred Capp and his partners, builder Zach Winters and developer Phil Katz, found a vacant lot on cozy Sunnyside Avenue in East Falls, they knew the size made it ideal for a new project. “We were interested in the lot because of its unique dimensions,” Capp said. In the middle of a row, the land was 16 feet wide and 100 feet deep. The enormous skylight and landscaped atrium are the central features of a four-bedroom rowhouse that otherwise looks like its neighbors. “It bathes the house in light, and the three-story wall with planter boxes brings a unique tropical flavor to an otherwise seemingly typical Philly rowhome,” Capp said. The new construction also gave the trio the opportunity to install other attractive features, such as two-car, off-street parking and a 950-square-foot roof deck with an adjacent indoor wet bar. The home also features hardwood flooring throughout and stainless-steel appliances. The property is also electric-car-charger-ready. 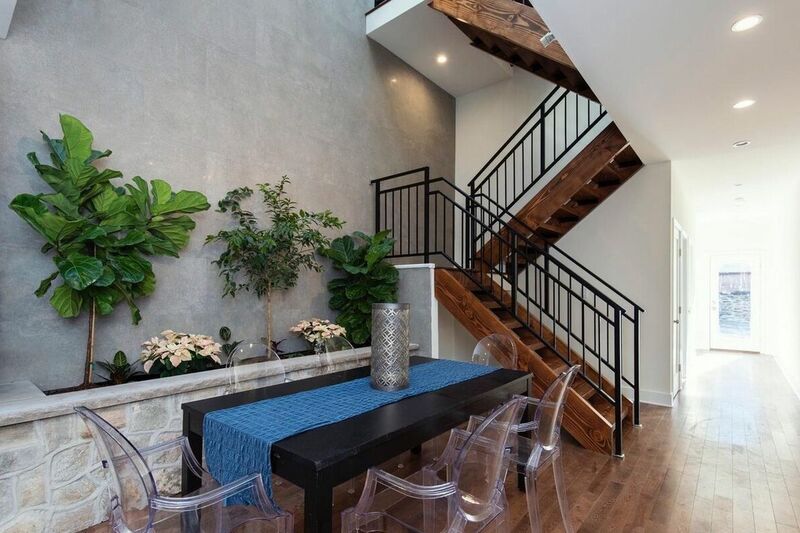 Beyond the fact that the house is new, Capp said he expects buyers to be drawn to the unusual interior atrium. As an East Falls resident himself, he said thinks the burgeoning neighborhood in the northwest section of the city also will be a draw. The home is listed for $699,000 by Katie Lantz at Noah Ostroff’s Keller Williams team.